The death Tarot card, no 13 in the tarot deck. Most people panic when they see the death card pop up in the spread laid out in front of them. 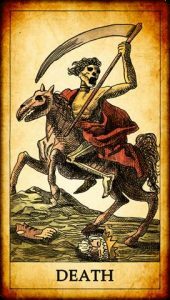 The death card does not mean physical death. This card means Transition, transformation, rebirth and permanent changes ahead, and in no uncertain terms. Are you in the habit of clinging to the past? If so then expect a complete turnaround. Quite suddenly your situation changes dramatically but in the end improves very much for you. You dread getting up from your bed in the morning to go to work. You can’t sleep at night because of the dread relating to the next day. You are tired and worn out with it all and feel like crying sometimes. You have stuck out a job you hate, purely for the steady income. You may lose this job or quit, but you will replace it quickly with something better and may even go back to school to add another string to your bow. You end the relationship that you have outgrown. You have fallen out of love with your partner but stick it out for the children. You have been afraid to leave and have worried what would become of you and maybe a son or daughter or both. Yes, it may hurt you deeply to leave, alas it is another broken dream. In the end, you find a happier, more fulfilling union with a new partner. Sunshine after the rain. A door shuts and there is no going back through that door but you will find you are moving on because you have no choice, but the difference is, your life will be changing in all areas for the better. Loss of finances or a poor financial forecast but only to be replaced with great improvement. You not only learn from this period of hardship but gain financially too in the end. Transformation occurs when you start to release all that is not good for you. A relationship with someone who makes you so angry or irritated that he/she has worn you down. Dont put up with anything from anyone that does not try to make you happy. We can have very little money but be so content with our lot because the devil that we know, has gone away and off our pathway, whether that be a tired or violent relationship, bad job, poor finances, Go and find yourself again.